ALL DAY DINING DEAL Receive a Wristband to enjoy All You Care To Eat and Drink All Day at participating restaurants. This deal includes 1 entrée, 1 side item OR dessert, and 1 regular size non-alcoholic beverage (fountain drink, iced tea or 20oz. bottled water) for every hour of that day. Child’s Price includes Kids Meal entrees only. Prices are per person and do not include sales tax. Refunds available anytime prior to the day of park visit. SINGLE DAY TICKET +ALL DAY DINING DEAL Enjoy all the per of the All Day Dining Deal included in this single day ticket package. Purchase tickets in advanced (at least 1 day prior to visit) online for exclusive pricing. AAA Members can show their cards and receive 10% discount off select in-park dining locations. SeaWorlds Facebook Visit their deal page to see if any special food discount coupons have been posted for your visit. SINGLE PARK TICKET When you advance purchase your single day ticket on SeaWorld’s official website you can save $20. Print them from home and head straight for the front gate when you arrive at SeaWorld. Tickets are good for 1 year from purchase date. 2-PARK TICKET Purchase a 2 park ticket and choose from SeaWorld Orlando, Aquatica Orlando, and Busch Gardens Tampa Bay, & Adventure Island (during open season). Included in this multi-park ticket you are provided with shuttle service to and from Tampa Bay and Orlando. Reservations are not required, however strongly recommended due to high demand. The number to arrange a shuttle service is 1-800-221-1339. First park visit must be made within 1 year of purchase date, and the second visit should be within 6 months of the first. Save $30 when you buy online in advance. 3-PARK TICKET Another great multi-park ticket with big savings online is the 3-park ticket. Save $30 and visit any 3 of the 4 parks included in the 2-park ticket. Shuttle service is also complimentary with this ticket. All requirements are the same as the 2-park ticket. The multi-park tickets do not include admission into events such as Hall-O-Scream. UNLIMITED VISITS + FREE PARKING Receive a $20 discount when you purchase your unlimited park ticket in advance, n SeaWorld’s official website. This ticket is great for locals and families on long vacations. It includes free general parking and unlimited visits to SeaWorld Orlando, Aquatica Orlando, Busch Gardens Tampa Bay, & Adventure Island (during open season). Tickets are valid within 1 year of purchase date for 14 consecutive days. Shuttle service is complimentary as well. COLLEGE STUDENTS with an International Student Identity Card (ISIC) membership can get 15% off an admission ticket to SeaWorld when purchasing through the ISIC website. PUBLIX GROCERY STORES Some Florida Publix grocery stores carry discounted SeaWorld tickets and sometimes special deals on gift cards. If you’re in Florida and decide to go to SeaWorld at the last minute, it might be worth checking out Publix before going to the park. SEAWORLD’S HAPPY TAILS SeaWorld partners with local animal shelters and humane societies to encourage pet adoptions. The program will provide pet lovers two free single-day admissions to SeaWorld when they adopt a dog or cat from a participating animal shelter. This offer is good for a limited time. Visit the Happy Tails web site for a list of participating Orlando, Florida shelters. Tickets are valid for a single-day admission to the park any time within one year of purchase. Tickets will be printed onsite at participating shelters so when you get to SeaWorld you can just head straight for the front gate! ACTIVE & RETIRED MILITARY & DOD EMPLOYEES Military & DOD members can receive discounted SeaWorld and Aquatica tickets through their military base MWR offices and Shades of Green, located on Walt Disney World property. Currently a 1 Day SeaWorld ticket is $72 for ages 3 and up. There is also no tax on these tickets. A SeaWorld/Busch Gardens Combo ticket is $92 for ages 3 and up with no tax. Shuttle transportation is available from Shades of Green to Sea World Orlando for a nominal round trip fee of $ 10.00 per adult and $ 5.00 per child. Under 4 is free. AAA MEMBERS Show your valid AAA card at the gate of SeaWorld Orlando and receive $5 off for up to 6 guests. HILTON HONORS Cash in points for Entertainment Rewards that include SeaWorld Orlando. 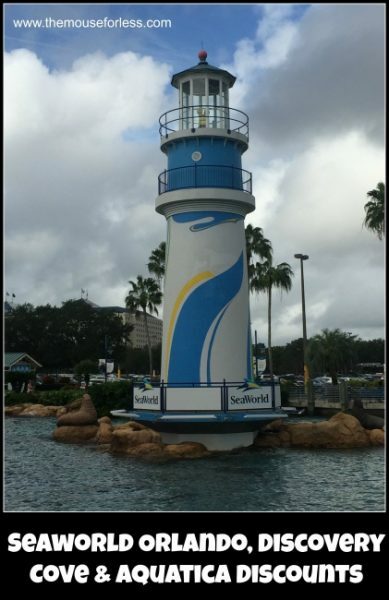 Single day SeaWorld Orlando tickets are 39,000 points for an adult/child ticket. AMERICAN EXPRESS MEMBERSHIP REWARDS Points can be redeemed for SeaWorld tickets. One single day ticket is 10,300 points. CANADIAN AIR MILES Members of their frequent flier program can redeem air miles for SeaWorld tickets. 3 MONTHS FREE For a limited time purchase any annual pass in full and receive 3 extra months free. Not valid for EZpay, offer ends January 3, 2018. FLORIDA RESIDENTS The annual pass for a Florida resident includes extra benefits you would not receive with any other annual passes. Reserved seating at select shows and restaurants. Unlimited admission to SeaWorld Orlando, SeaWorld San Diego, SeaWorld San Antonio, Busch Gardens Tampa Bay, Busch Gardens Williamsburg, Advenure Island Tampa Bay, Aquatica Orlando, Aquatica San Diego, Aquatica San Antonio, Water Country U.S.A., & Sesame Palace. EZPAY Also only available to Florida residents, the EZpay option allows you to break up the annual pass prices into 12 low monthly payment. Valid Florida license (with current Florida resident address) must be shown at the time of purchase. SEAWORLD SIGNATURE SHOWS SEATING Annual pass holders get a 10% discount when purchasing through the Pass Member website. Pricing and shows may vary by season. Event concerts and SeaWorld’s Christmas Celebration shows not included. A new mobile website supports using your phone to purchase and use SeaWorld theme park tickets. Smart phone users, including iPhone and Android phones, can point their web browsers to seaworld.com to purchase One-day Tickets, Fun Cards, or Silver and Platinum Annual Passes. Once the purchase is complete, guests can use the parks’ mobile websites to access the ticket and enter the turnstiles. The websites also will offer “upsells” of animal encounters, tours and dining packages, based on which ticket was purchased. Quick Queue at SeaWorld Orlando is a paid way to skip the lines for the park’s most popular attractions, like Manta, Kraken, Journey To Atlantis, & Wild Arctic and more. Pass includes one complimentary ride on Skytower. The price varies by season. It’s around $20 to $35 for unlimited Quick Queue. Parking fee for SeaWorld is $17.00 per day for automobiles & motorcycles and $22.00 per day for RV’s and campers. Preferred parking available for $22.00. Platinum Passport members receive complimentary preferred parking. 1 year and 2 year Passport members can park in general lots for free, and pay only $10.00 for preferred parking. Those visiting more than one Anheuser-Busch parks in the same day pay to park only once. For information on how to get to Seaworld from Walt Disney World without a car, click here. Most Anheuser-Busch combination theme parks tickets that include SeaWorld and Busch Gardens are available on either park’s web site. However, purchasing them on SeaWorld’s web site yields a small savings in tax rate. Most Anheuser-Busch combination theme parks tickets that include Busch Gardens and Seaworld, as well as the Orlando FlexTicket, offer free round trip shuttle service for the ride from Orlando to Busch Gardens in Tampa. Seaworld’s Platinum Pass gives a host of benefits like discounts on merchandise and tickets that you buy for friends, reserved seating for shows and discounted admission to Discovery Cove. You get free preferred parking, which is only steps away from the entrance. The merchandise discount is also good on the purchase of Quick Queue – a paid option that lets you use a shorter line. Plus, you get a second ride on the major roller coasters (Manta excluded). Just flash your pass and you don’t even have to leave your seat. The Platinum Pass has re-ride privileges at Busch Gardens Orlando, too (Cheetah Hunt excluded) and reserved seating at select Busch Gardens shows. RESORT DAY PACKAGE A resort day package without the dolphin swim experience usually ranges between $170.00 to $219.00 depending on the day of your reservation. Included in this package you will receive complimentary breakfast, lunch, snacks all day, and beverages all day. Enjoy free access to lockers, wetsuits, showers, sunscreen, and self-parking. If you’re not doing the dolphin experience (not included in this package) check out the Explorers Aviary to feed exotic birds, lounge around in the Wind-Away River or Serenity Bay, or hang by the Grand Reef for some family beach time! Also for your resort day package guests are given free admission and unlimited access to SeaWorld Orlando and Aquatica Orlando for 14 consecutive days around the time of Discovery cove reservation. ALL INCLUSIVE DOLPHIN SWIM PACKAGE With this package ranging from $229.00 to $319.00 per guests you get an unforgettable experience for your party. Children are of course welcome to swim with the dolphins however any child between the ages of 6 & 12 must be accompanied by someone 18 years of age or older who is also participating, and have a signed waiver by a parent or natural guardian. This package is not for children under the age of 6. As an all inclusive package enjoy all the amenities and beach areas listed in the Resort Day Package including unlimited access to SeaWorld Orlando and Aquatica Orlando for 14 consecutive days around the time of your reservation. TRAINOR FOR A DAY Join one of Discovery Cove’s trainors for the whole day to learn about their extensive knowledge of the animals at the park, and enjoy at 30 minute session swimming with the dolphins. With prices ranging from $418.00 to $528.00 this package includes everything in the resort day package as well as an enhanced deep-water dolphin interaction, private photo session, behind the scenes tour, and a Discovery Cove gift bag. AUTO SOUTH CLUB A small discount is usually available on Discovery Cove admission through Auto Club South AAA offices. This discount is only available for Auto Club South members and is not available through other regional offices. PHOTO PACKAGE Receive discounts on Discovery Photo Packages when you reserve one of Discovery Cove’s special occasion packages. SHARK SWIM For $85.00 you can add on this amazing shark swim experience where you can learn about and swim with different species of shark. This experience happens at 11:30am and 12:00pm, so you’ll want to plan your day accordingly, especially if you have multiple add-ons. RAY FEEDING This $50 add-on is great for early risers. Arrive at Discovery Cove at 7am and get the chance to feed and learn about Discovery Cove’s fish and rays. This add-on includes a Q&A session with one of the very educated Aquarists, a 30-45 minute feeding session, and a private swim in the Grand Reef once the feeding is over. To take part in the feedings guests must be at least 6 years old and comfortable in water. SEAVENTURE The Seaventure add-on starts at $49.0 per person and is an extensive underwater walking tour of Discovery Cove. 5% of it’s proceeds go to the Rising Tides Conservation project. ULTIMATE PACKAGE For $25.00 you can add on the ultimate package and receive unlimited access to Busch Gardens Tampa Bay as well as SeaWorld Orlando and Aquatica Orlando. Also get free parking at all three parks. Discovery Cove is an all-inclusive park that includes snacks and meals. If you’ve booked one of the day packages, skip breakfast on the way to the park. There will be places to grab something once you get there. Also don’t bother packing towels or shampoo as these items are provided in the shower area. Discovery Cove’s special occasion packages do not include admission to Discovery Cove, purchase of a Dolphin Swim package may be required. Call 407-513-4600 for more details. Located across the street from SeaWorld Orlando, Aquatica features nearly 40 water slides, lagoons, and lazy rivers. You’ll also find beach areas for relaxing and special animal exhibits, including dolphins, tropical fish, colorful macaws and assorted small animals. 1 DAY GENERAL ADMISSION TICKET Purchase your Aquatica Orlando ticket for guests ages 3 + for $59.99 and receive unlimited access to everything in the park for the day, plus free parking. Ticket is valid 1 year from purchase date. SINGLE DAY Right now when you purchase your 1 day ticket on Aquatica’s official website you can save $20.00 by purchasing in advance. SINGLE DAY + DINING When you purchase your single day + dining ticket online in advance you can save $28.00. This ticket includes your single day admission to the park plus 1 free meal and a souvenir drink all day cup. Meal includes 1 entrée, 1 all day drink cup, 1 snack, and 1 side or dessert per ticket. 2-PARK TICKET Save $30.00 when you buy in advance on Aquatica’s official website. With the 2-park ticket receive access to two of the following parks, Aquatica Orlando, SeaWorld Orlando, Busch Gardens Tampa Bay, and Adventure Island Tampa Bay. You can visit Aquatica twice or Aquatica plus one visit to any of the parks listed. Ticket valid within 1 year of purchase date, second visit must be made within 6 months of the first. 3-PARK TICKET Purchase your three park ticket in advance, online and receive $30.00 off. This ticket allows you access to 3 of the 4 parks listed in the 2-park ticket description. Round trip shuttle service is complimentary for both 2 and 3 park tickets. ULTIMATE VISITS + PARKING Receive $2.00 off when you purchase online, in advance and get unlimited access to all 4 parks previously listed for 14 consecutive days. Plus free parking! COLLEGE STUDENTS with an International Student Identity Card (ISIC) membership can get 15% off an admission ticket to Aquatica when purchasing through the ISIC website. ACTIVE & RETIRED MILITARY + DOD EMPLOYEES Discounted Aquatica tickets can be obtained through their military base MWR offices and Shades of Green, located on Walt Disney World property. Currently a 1 Day Aquatica ticket is $26 for ages 3 and up. There is also no tax on these tickets. A Seaworld/Aquatica Combo ticket, valid for 14 consecutive days is $116 for ages 3 and up with no tax. Shuttle transportation is available from Shades of Green to Sea World Orlando for a nominal round trip fee of $ 10.00 per adult and $ 5.00 per child. Under 4 is free. AAA OR CAA CLUB MEMBERS Check with your local office for discounted prices on Aquatica tickets. HILTON HONORS Cash in points for Entertainment Rewards that include free 2 Day Aquatica/SeaWorld Orlando tickets. Two day tickets are 56,000 points for ages 3 and up.